This is the Home screen of the App. 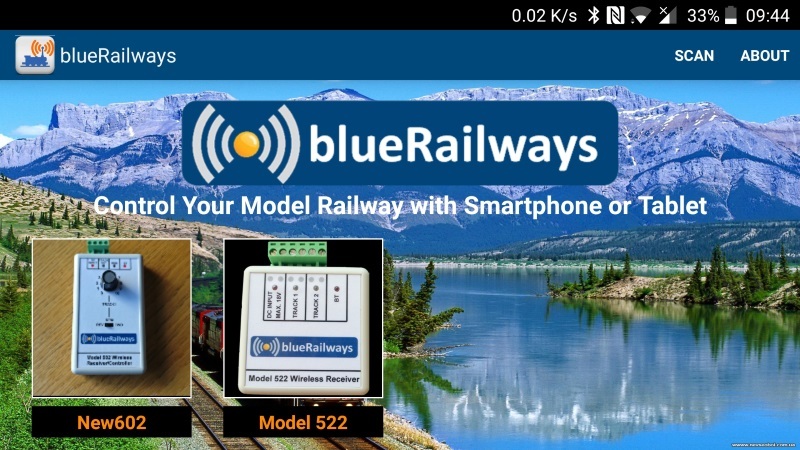 When the App is run, the Smartphone/Tablet starts a scan for blueRailways devices and shows those that it discovers. Each blueRailways device has a unique address and the devices are identified by the names that they have been given. For the Model 602 the name and photo can be chosen in the Locomotive Settings screen shown below but these are fixed for the Model 522. A comforting BEEP is sounded for each device found. 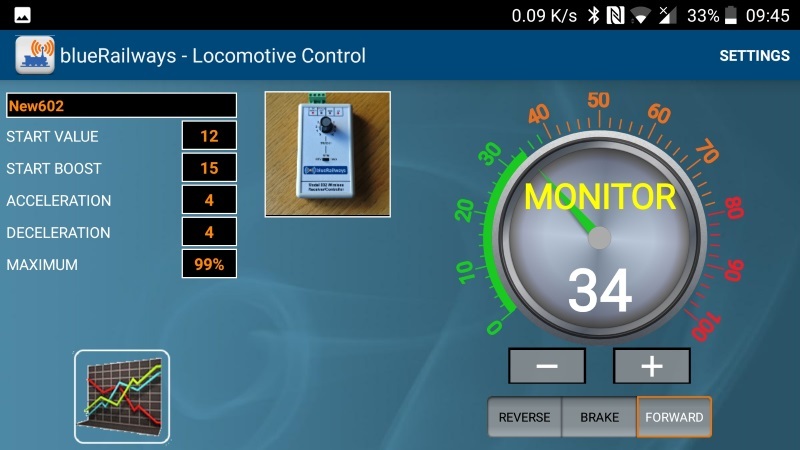 The preferred device is selected by touching the photo, which initiates the connection between the Smartphone/Tablet and the Receiver/Controller and displays one of the two Locomotive Control Screens below. This is the main Locomotive Control screen for the Model 602. The name and allocated photo are displayed together with the values for the control variables. If the Receiver/Controller is operating in Monitor mode (loco speed and direction set on the Receiver/Controller) the dial will show the position of the knob on the Receiver/Controller, and the outer ring and numeric display showing the actual speed. In Control mode the dial sets the requested speed of the loco. 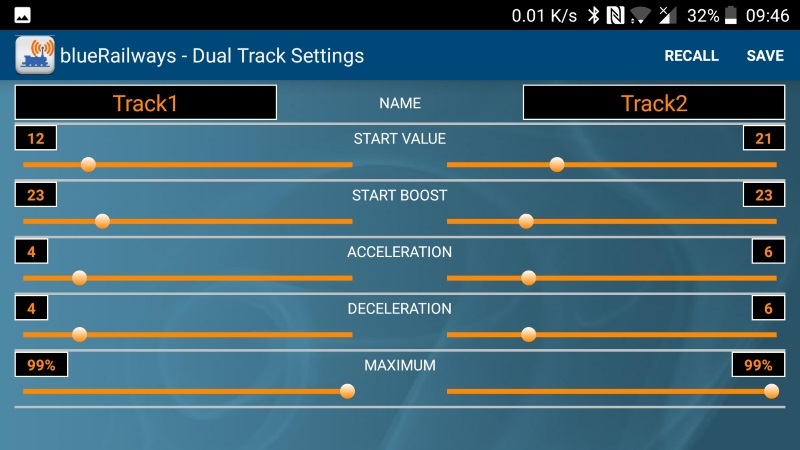 In both modes the actual speed of the loco will be determined from the requested speed and the acceleration/deceleration variables and limited to the maximum speed setting. Selecting BRAKE once will use the deceleration setting to stop the loco whereas selecting EMERGENCY STOP will instantly stop it. 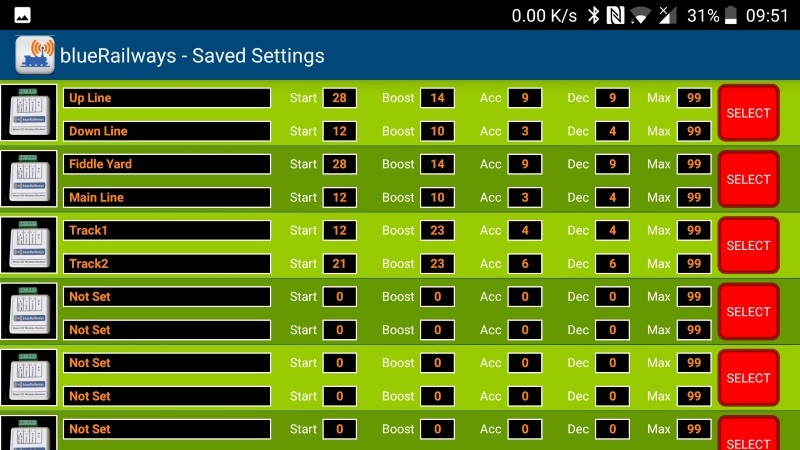 From this screen can also be selected the Parameter Graph, Auto control and Locomotive Settings screens. This is the main Control screen for the Model 522 with dual track control. The requested locomotive speeds are set by the dials. The actual speed of the locos will be determined from the requested speed and the acceleration/deceleration variables and limited to the maximum speed setting, and are shown on the outer rings and numeric displays. Selecting BRAKE once will use the deceleration setting to stop the loco whereas selecting EMERGENCY STOP will instantly stop both locomotives. The Dual Track Settings screen shown below is selected from the Settings menu. This is selected via the Settings menu on the Locomotive Control Screen for the Model 602 and sets up the loco's control variables. The name and control variables are saved in the Receiver/Controller memory, are operative in local and remote control modes and retained when the Receiver/Controller is switched off. This means the variables are operative when the Smartphone/Tablet is not being used. A photograph can be allocated to the Receiver/Controller which can be selected from the Smartphone/Tablet images. So you can take a photograph of your loco for exact identification or edit/create your own image. This image reference is stored in the Smartphone/Tablet so moving to a different Smartphone/Tablet will require a new image to be associated. These control variables and name can be changed whilst the loco is running and will have an immediate effect. The Settings menu screen for Model 522 for dual track control. 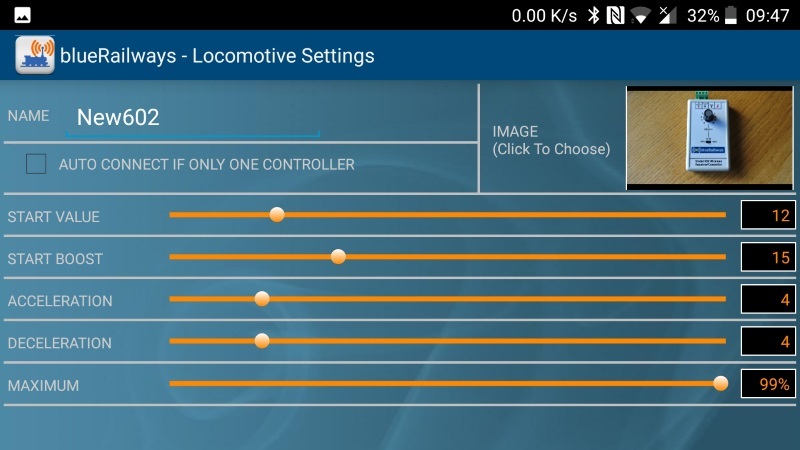 This is selected via the Settings menu on the Dual Track Control Screen and sets up the loco's control variables. The names and the control variables are saved in the Receiver/Controller memory, and retained when the Receiver/Controller is switched off. These control variables and name can be changed whilst the locos are running and will have an immediate effect. Previous saved settings can be quickly saved and recalled from the Save Settings screen - see below. A maximum of 8 settings for the Model 522 can be saved and recalled using this screen. This is very useful when changing locos on the track which may have different characteristics. Because it incorporates two-way communications, the Model 602 Receiver/Controller can transmit various parameters in real-time to the Smartphone/Tablet. 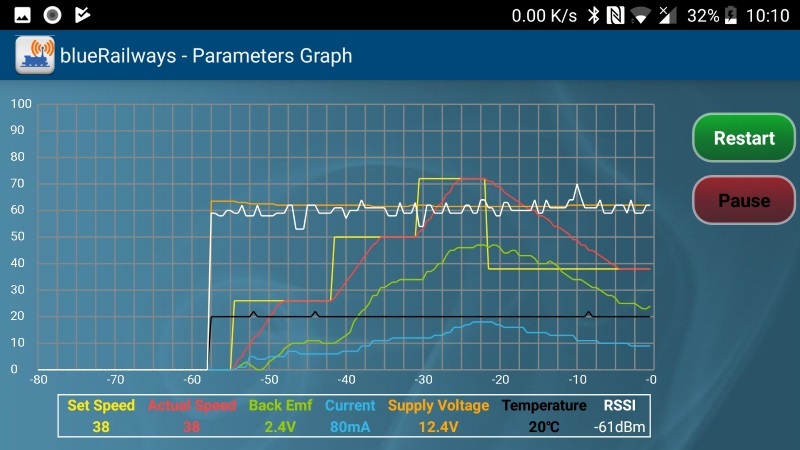 The Parameters Graph displays these parameters in graphical format and, at the bottom of the screen, in numerical format. They are continuously transmitted so there is no stop/start although the graph can be paused for closer exammination. The parameter measurements are not calibrated but should give a pretty good comparative measurement between different locos. The Supply voltage is the DC input voltage as the output voltage to the track is about 1.4V less. 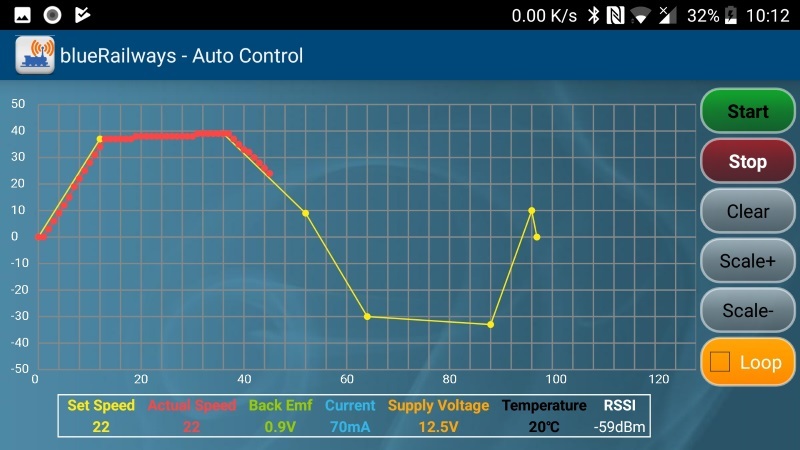 The RSSI (Received Signal Strength Indicator) is the strength of the signal that the Receiver/Controller is receiving. The back-emf is a measure of the motor speed and due to the motor gearing, if it has any, can be quite different between locomotives. This is for automatic control of the locomotive when using the Model 602 Receiver/Controller. Speed points are entered, by touch, against a time graph for the required speeds. When Start is selected a Zero speed point is automatically added at the end to ensure the loco stops at the end of the cycle. The loco will then follow the speed path requested, overriding the acceleration/deceleration settings, with the actual speed plotted against the requested speed in real-time. All the running locomotive parameters are displayed at the bottom of the screen whilst it is running and are recorded for the Graph display (above). The loco can be set to run in a continuous repetitive loop and the maximum time scale can be selected between 30 seconds and 4 minutes. Download the App from the Google Play Store (Click on Image). 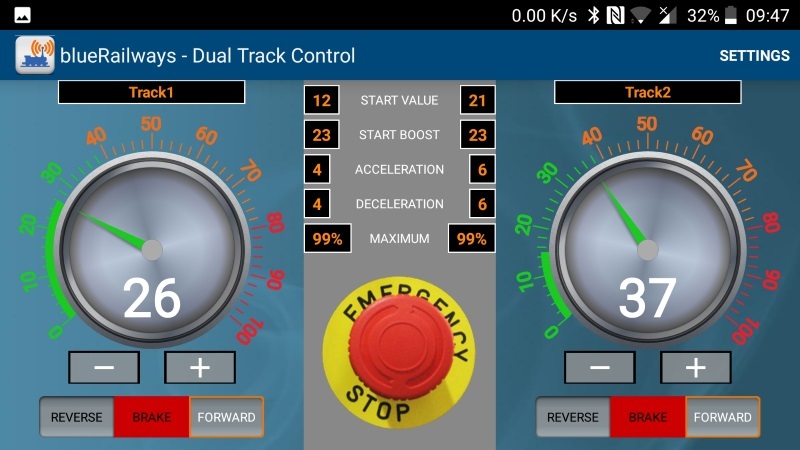 The blueRailways App incorporates a "MODEL 601 LOCO SIMULATOR" so it can be evaluated without requiring the presence of a Receiver/Controller.